Serving as president for forty-three years, Nicholas Murray Butler has the distinction of being the longest serving president in the history of Columbia University. An influential Republican, international statesman, educator and Columbia graduate (A.B. 1882, A.M. 1883, Ph.D. 1884), Butler successfully raised the University’s status to that of a leading institution of higher education and research. Overseeing the creation of several new graduate schools, including the School of Journalism (1912), the School of Business (1916), the School of Dentistry (1916), and the consolidation of the Columbia-Presbyterian Medical Center (1928), Butler doubled the size of the campus and significantly increased enrollment. The establishment of the Core Curriculum at Columbia College also occurred under Butler’s administration. In the larger world of education, he was a major force behind the creation of the National Education Council and the College Entrance Examination Board. Among Butler's contributions to global understanding and diplomacy, he persuaded Andrew Carnegie to establish the Carnegie Endowment for International Peace in 1910, and later served as its president. Among his many awards and achievements, Butler received the Nobel Prize for Peace in 1931 (along with Jane Addams), which recognized his work on the 1928 Kellogg-Briand Pact outlawing war as an instrument of international policy. 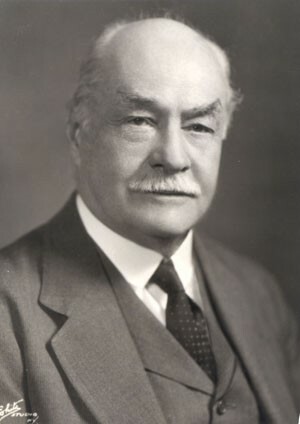 At the request of the trustees, Butler resigned as president at the age of eighty-three. Read more about N.M. Butler in Columbians Ahead of Their Time.